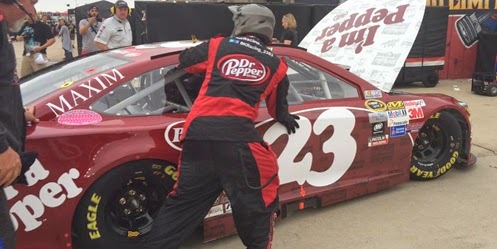 J.J. Yeley picked up the 14th last-place finish of his NASCAR Sprint Cup Series career in Saturday’s Duck Commander 500 at the Texas Motor Speedway when his #23 Dr. Pepper “I’m A Pepper” Toyota fell out with a blown engine after he completed 13 of the race’s 334 laps. The finish is Yeley’s first of the 2015 season and his first in a Cup race since last September at Richmond, 17 races ago. The finish occurred in Yeley’s 227th Cup start. Following the Richmond race, Yeley joined BK Racing full-time at Kansas driving the #83 Burger King / Dr. Pepper Toyota that had been vacated by rookie Ryan Truex and veteran Travis Kvapil. The Kansas race was Yeley’s best finish with the team that year - 29th, five laps down to the leaders. For 2015, BK re-organized its team into a three-car operation with Yeley taking the controls of the #23 vacated by the departing rookie Alex Bowman. Coming into Texas, Yeley had finished under power in all 6 of the season’s races, including a season-best 26th at Martinsville, where he’d recovered from an early spin. Yeley arrived in Texas with a radical new look on his #23 Toyota, which for the fifth time this year featured the Dr. Pepper brand. He timed in 44th of the 45 entrants during Friday’s opening session - ahead of Alex Kennedy’s #33 Dream Factory Chevrolet for Joe Falk - then improved to 39th in Happy Hour. Yeley ended up qualifying 41st later that day, turning in a lap of 188.673 mph. Teammate Matt DiBenedetto qualified one spot behind Yeley in the #83 while the third BK Racing machine - the #26 of rookie Jeb Burton - missed the show along with Brendan Gaughan. Just as in Friday’s XFINITY Series race, the battle for last place turned out to be a short one. The 43rd starting spot went to Alex Kennedy, who held the spot on the first lap before he passed DiBenedetto’s #83 Burger King Toyota. On Lap 8, the spot went to Mike Bliss and his #32 Texas Tech Ford. Still under green on Lap 13, Yeley pulled behind the wall with engine issues. The team looked under the hood, and after a handful of laps, announced on Twitter that the problem was terminal. 42nd on Saturday went to Ryan Blaney, who qualified 13th in the #21 Motorcraft / Quick Lane Tire & Auto Center Ford - his third top-15 start in just five Cup races. Blaney complained of engine issues early in the event, then pulled behind the wall when it finally let go on Lap 71. 41st went to Paul Menard, who had just raced his #27 Quaker State / Menards Chevrolet into the lead on Lap 221 when a water hose came loose, causing damage to his engine. Rounding out the Bottom Five were HScott Motorsports teammates Michael Annett and Justin Allgaier, who pounded the wall in Turns 2 and 3, respectively, in consecutive cautions on Laps 251 and 261. *This is Yeley’s first last-place finish at Texas since 2007, when his #18 Interstate Batteries Chevrolet was involved in a four-car accident with David Ragan, Casey Mears, and Ricky Rudd that ended his day after 1 lap of the Samsung 500. It was the first last-place run of Yeley’s Cup career. *This is the first last-place finish for the #23 in a Cup race at Texas and the first in Cup for the number since last fall at Talladega, when Alex Bowman’s Dustless Blasting Toyota crashed after 102 laps of the GEICO 500.